Application: universal rear light panel-Kenworth, Peterbilt, Freightliner, Western Star, Volvo, Mack, International IHC and other semi trucks. Mount: 4 adjustable slots on top, 2 each side. Size: box: 33 3/4" wide, 12 3/4" long, 3 1/8 deep. Location: rear of truck, between mudflaps. Style: covered rear panel, clear lens lights. 1 rear stainless steel center panel with back cover, 21493. 4 stop, tail, and turned reflector lights 4, clear lens, 7 red diodes, 39925. 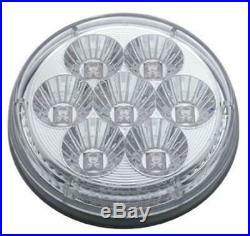 6 flat marker lights, 2 inch clear lens, 9 red diodes, 38363. 2 license plate lights, clear lens, 4 white diodes, 39930. 1 chrome license plate frame, 50003. 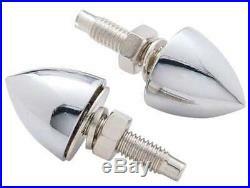 4 chrome license plate bullet fasteners, 10889. 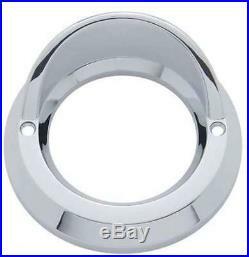 4 rubber grommets 4 inch, 31515. 6 rubber grommets 2 inch, 31505. 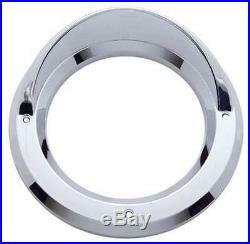 4 chrome plastic bezels, 4 with visors 10483. 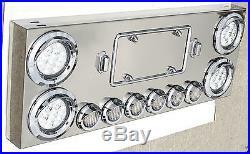 6 chrome plastic light bezels, 2 with visors 10481. The item "Rear LED tail light panel stainless steel for Peterbilt Kenworth Freightliner" is in sale since Wednesday, March 15, 2017. 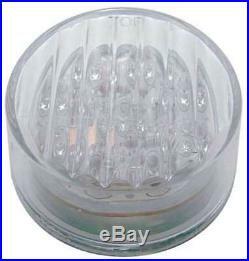 This item is in the category "eBay Motors\Parts & Accessories\Commercial Truck Parts\Lighting\Exterior Accent Lights". The seller is "truxmart" and is located in Bayard, Nebraska.